Count the total number of Nodes using recursion. The counts in the above tree is 5. What is Leaf Node ? Leaf Node is a node having both left and right child nodes of it are NULL. 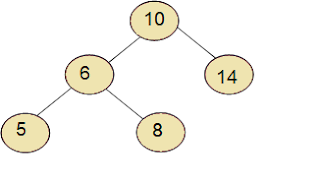 In the above Tree, Nodes 5, 8 and 14 doesn't have left and right child nodes. There are 3 leaf nodes in the given BST. Java Program to Count the number Leaf Nodes in the given Binary Tree.